For many people, the festive season brings excitement and joy. The Christmas spirit takes over and a frenzy of shopping, wrapping and cooking ensues. For some, the panic of hosting a big Christmas do can put a damper on the joy of the festivities. Hosting a Christmas dinner is a big responsibility. Christmas food is an important part of the day, perhaps more anticipated than the presents. 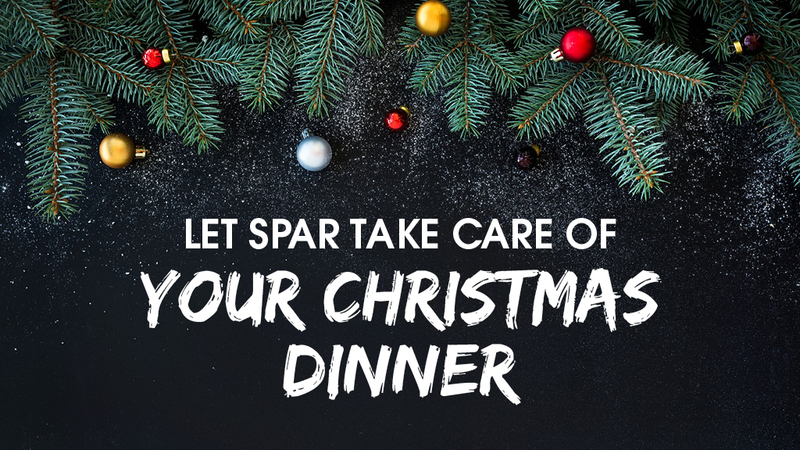 Luckily, SPAR is here for all your Christmas dinner needs. Print out these recipes for a starter, main dish and delicious Christmas trifle for desert and your guests will be so impressed, they will want to come back again next year! Christmas dinner is normally a big filling meal, so you don’t want your starter to be too heavy. These lovely light spring rolls will whet your guests’ appetite without filling them up. For ease and convenience, you can prepare the spring rolls ahead of time and put them in the freezer. Fry from frozen on the day and your first course will be ready in less than ten minutes. 1. Heat the 15ml oil in a pan and fry the onion until soft. 2. Add the chicken and cook until brown. 3. Stir in the carrots, sachet of soup, Thai green curry paste and sweet chilli sauce. Allow to cook for 10-15 minutes. 4. Remove from heat then stir the coriander through. Allow to cool. 5. Place 2 sheets of phyllo pastry on a work surface and carefully cut the pastry into quarters with a sharp knife. 6. Spoon about two tablespoons of filling onto the corner of the pastry closest to you. Brush the corner and edges with water to seal and roll up the pastry to encase the filling, folding in the sides as you go. *If you are going to freeze the spring rolls, do so now and follow the next steps when you are ready to cook them. Remember to cook from frozen. 7. Heat the oil in a pan and fry in batches until golden brown. Remove from the oil and drain on a paper towel. 8. Combine the mayonnaise and sweet chilli sauce to dip in. Makes about 12 spring rolls. This unique twist on an old favorite will have your guests lining up for seconds. Serve the gammon with roasted apples, micro leaves and apple jelly, with other sides such as roast potatoes, rice salad, and sweet cinnamon butternut. 1. Place the gammon in a large pot. Add the ginger beer, tea, peppercorns, bay leaves, juniper berries and onion, and bring to the boil. Reduce heat and allow to simmer for 90 minutes. 2. Remove from heat and allow to cool slightly. Carefully pull the skin off the gammon, leaving the fat intact. Discard the skin and allow the gammon to cool in the liquid. 3. Preheat your oven to 180°C. 4. Place the glaze ingredients into a saucepan and heat until melted. 5. Care the apples and scoop out enough flesh to form a 15ml (1 tablespoon) cavity. 6. Combine the butter, honey and mixed nuts in a bowl. Divide the mixture between the 6 apples and fill each cavity. Press a cinnamon quill into each apple and set aside. 7. Score the fat of the gammon in diamonds and place on an oven tray. 8. Brush with glaze and place the apples around the gammon. Bake for one hour, basting with glaze every 20 minutes. This trifle can be made in a large glass bowl for a big family gathering, or can be layered into individual glasses for a sophisticated look. This trifle is even better when prepared the day before and kept chilled until ready to serve. Brandy or SPAR orange fruit juice blend, or both mixed. Toppings: vermicelli, Hundreds&Thousands, chopped pecan nuts, SPAR maraschino cherries, etc. 1. Spread each half of the sponge cake with a combined mixture of fruit mince and apple sauce. 2. Cut into long slices and arrange them fairly loosely in the base of the bowl. (cut them smaller if you are doing individual glasses). 3. Pour the orange juice or brandy or mixture over to moisten the cake. 4. Sprinkle half the meringues. 5. Spoon the fruit cocktail over, followed by the strawberry sauce. Sprinkle the remaining meringues over. 6. Pour on the custard. 7. Whip the icing sugar and cream together until peaks form. Completely cover the custard layer with the cream. 8. Finish off with toppings off your choice and add well-drained maraschino cherries just before serving. A SPAR Freshline un-iced fruit cake or steamed pudding, cubed and soaked in the orange juice (with a little brandy if you like) makes a moist and rich alternative to the apple-mincemeat-sponge layer.